Frederick William Gregory did not die, well not when young anyway! . 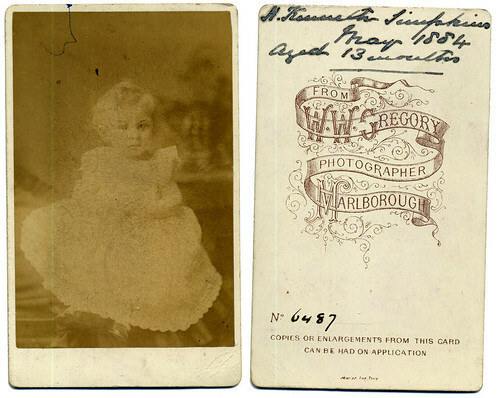 He married the sister of my Great Grandmother, Mabel Alice Cuthbert in June 1889 in Wisbech, Cambridgeshire. In the 1891 Census, they are shown living in St James, Hampstead in London. Sometime between 1891 and 1901 they left England and lived in Germany for some years as their daughter Joan was born in Berlin in 1905. Frederick often described himself on the census docs as a photographer, but am unable to find any listing of him anywhere as a photographer. Nor have I been able to discover why he and his wife went to Germany. By the 1911 Census, they had returned to England and lived at Willesden for some time. So some solutions, but a lot of unsolved questions! Hello Anne. Thank you so much for your reply. Very interesting. I wonder if Frederick always worked for other photographers and that is why you can’t find him listed. Did you ever meet Joan?